Vermont defenseman NICK LUUKKO (25), a very local product from West Chester, Pennsylvania, who was the sixth round selection (# 179 overall) of the Philadelphia Flyers at the 2010 National Hockey League Draft, shields the puck from forechecking Penn State right wing ERIC SCHEID (19), the sophomore transfer hailing from Blaine, Minnesota, during the NCAA non-conference match billed as the 2nd Philadelphia College Hockey Faceoff at the almost-full Wells Fargo Center in Philadelphia, Pennsylvania. Sometimes the less said is better … and so it shall be here. Penn State center TAYLOR HOLSTROM (28), the redshirt junior from Yorba Linda, California, who finished last season as the Nittany Lions’ third-leading goal-scorer having lit the lamp nine times, stabs the puck, which is clearly visible at the knee of crumpled Vermont left wing HOWARD LENZ (11), just over the goal line before the net is dislodged to give the Blue & White an early 1-0 lead in the NCAA non-conference clash at the Wells Fargo Center in Philadelphia, Pennsylvania. Penn State left wing CASEY BAILEY (25), the slumping sophomore from Anchorage, Alaska, who scored 14 goals in 27 games for the Nittany Lions last season but has now been held off the scoreboard for the first five contests to begin this 2013/14 campaign, and Vermont center MATT WHITE (19), the sturdy senior (6’2″ 198″) from the Pittsburgh area who was the third-leading scorer with 20 points (9 go, 11 as) for the Catamounts a year ago, battle for the puck along the boards during the so-called Philadelphia College Hockey Faceoff at the Wells Fargo Center on South Broad Street. The current UNIVERSITY of VERMONT squad certainly turned more than just a few heads by giving the seven-time NCAA national champion University of North Dakota, who, not surprisingly, are ranked very highly once again this season, all it could handle in a two-game series on the road in Grand Forks a couple of weekends ago and should be well rested coming into the PHILADELPHIA COLLEGE HOCKEY FACEOFF against Penn State. The Catamounts unveiled several promising freshmen and gained a tremendous amound of respect in a narrow 5-3 loss and tightly-contested 2-2 tie with a very proud North Dakota program that has made 28 all-time appearances (44 wins, 23 losses) at the prestigious NCAA men’s ice ice tournament. 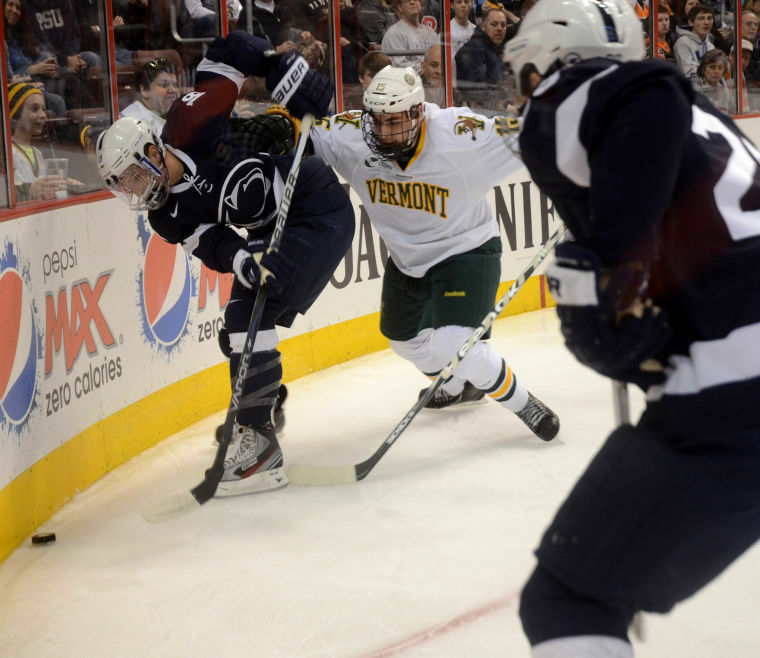 Vermont, who are capably steered by ten-year head coach KEVIN SNEDDON, finished last season with a rather sup-par record of 11 wins against 19 losses with 6 ties although the Catamounts did deliver a slighltly better mark (8-13-6) against always fierce Hockey East competition. The losses are very, very minimal although Canadian legionnaire KYLE REYNOLDS, the junior left wing from Sylvan Lake, Alberta, who was Vermont’s third-leading scorer with 20 points (nine goals) last term is out for this season after suffering a knee injury in the Catamount’s pre-season exhibition with the University of Ottawa. Returning to spearhead the attack for Vermont in Phialadelphia is local product CHRIS MCARTHY, the talented fifth-year senior right wing (6’1″ 190 lbs) from Collegeville, Pennsylvania, who led the Catamounts last season in goals (13), assists (18) and points (31). Centering Vermont’s most dangerous scoring line is JACOB FALLON, the undersized (5’10″ 187″ lbs) junior transfer from the University of Michigan who finished as the Catamounts’ second-leading scorer with 22 points (nine goals). Rounding out the number one unit is left wing CONNOR BRICKLEY (6’1″ 195 lbs), a senior from Everett, Massachusetts, who was selected by the Florida Panthers in the second round (# 50 overall) of the 2010 National Hockey League Draft. Several of the Vermont forwards have not been big goal-scorers throughout their college careers but do bring a certain amount of experience to the table. MATT WHITE, the senior center from McMurray, Pennsylvania, who totaled six goals and 16 points last season could be looking be making a statement. One talented newcomer to keep an eye on for the Catamounts is left wing TOM FORGIONE, a homegrown freshman (5’10″ 183 lbs) from South Burlington, Vermont, who nabbed a goal in the two-game series with mighty North Dakota. Another newcomer to watch is right wing BRENDAN BRADLEY, a lanky freshman (6’0″ 170 lbs) from Richboro, Pennsylvania. Philadelphia-area native NICK LUUKKO, the tall junior (6’3″ 195 lbs) who was tabbed by the Philadelphia Flyers in the 6th round (# 179 overall) of the 2010 NHL Draft, anchors the Vermont blue line along with the familiar defense pairing of MICHAEL PALIOTTA (6’4″ 205 lbs), the hard-hitting junior from Westport, Connecticut, who was selected by the Chiacgo Black Hawks in the third round (# 70 overall) of the 2011 NHL Draft, and Canadian legionnaire CAYLEN WALLS, a sophomore (6’1″ 200 lbs) from Lyalta, Alberta. 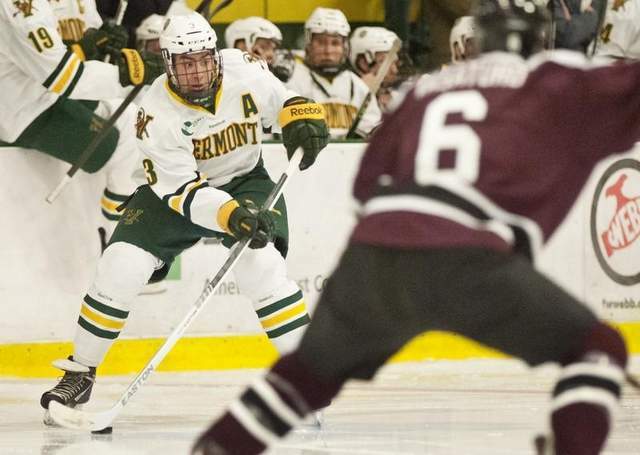 Vermont are very excited about the addition of freshman defenseman ROB HAMILTON (6’0″ 180 lbs), the Canadian legionnaire from Calgary, Alberta, who registered a goal and three points in his first two NCAA games against a tough North Dakota outfit. Canadian legionnaire BRODY HOFFMAN was the workhorse (36 ga, 2.86 avg, .904 svpct) in between the pipes for Vermont as a freshman last season but begins his sophomore campaign on the injury shelf. Forced into action has been MICHAEL SANTAGUIDA, the undrafted freshman from Mississauga, Ontario, who did not disgrace himself in either of the Catamounts’ two games on the road in North Dakota. Santaguida, in fact, was particularly impressive with 31 saves in Vermont’s 2-2 tie with the former Fighting Sioux. Penn State left wing COREY BAILEY (18), the undrafted freshman from Anchorage, Alaska, who was destined to score a clinching fourth goal for the Nittany Lions later on, shields the puck from Vermont defenseman YVES PATTYN (15), the freshman from Ste. Anne, Manitoba, along the wall during the NCAA non-conference contest watched by the spectacular crowd of 19,529 college hockey fans at the Wells Fargo Center on South Broad Street in Philadelphia, Pennsylvania. It will always be remembered as a monumental occasion in school history and one that, in fact, evolved into a landmark event which clearly provided the fledgling PENN STATE varsity ice hockey program with the necessary momentum to conclude its first-ever season of competition at the elite Division I-A level by accomplishing even bigger and better things (read, an upset triumph on the road over a former national champion desperate for victories in order to qualify for the NCAA tournament at that point in time). Very few people will actually recall that only four days before, the Nittany Lions had inexplicably lost 3-2 in overtime on home ice at the Greenberg Pavilion in State College to a little-known Division III squad, minuscule Neumann University (a private Roman Catholic school, located in southeastern Pennsylvania very near the state border with Delaware, which has an enrollment barely in excess of two thousand undergraduates). Or, perhaps, that coming into the clash with the visiting University of Vermont at the inaugural PHILADELPHIA COLLEG HOCKEY FACEOFF at the Wells Fargo Center on South Broad Street, Penn State were in the midst of a disastrous stretch that had seen head coach GUY GADOWSKY’s side pick up just one win and eight losses in their last nine games against Division I opposition. 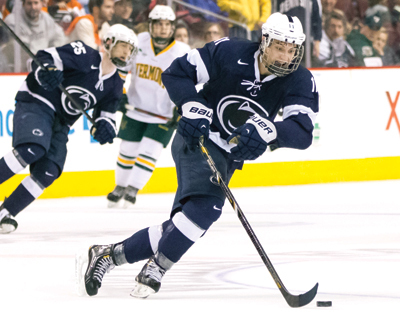 Penn State center DAVID GLEN (11), the freshman from Fort Saskatchewan, Alberta, who ended up leading the Nittany Lions’ first-ever NCAA squad with 16 goals from 27 games last season, netted an important strike near the end of the first period against Vermont in South Philly. On paper, the match-up clearly appeared to favor the visitors from New England coming out of the powerful and respected Hockey East conference. After all, the Vermont Catamounts have been competing at the highest collegiate level since the mid-1970s and have qualified for the prestigious NCAA men’s ice hockey tournament five times (1988, 1996, 1997, 2009, 2010) and reached the Frozen Four twice (’96, ’09). Among the Vermont program’s 14 products who have reached the pinnacle of the professional game in the National Hockey League include JOHN LECLAIR (a multiple 50-goal scorer during his career for the Philadelphia Flyers) as well as Stanley Cup winners MARTIN ST. LOUIS (Tampa Bay Lightning), TIM THOMAS (Boston Bruins) and PATRICK SHARP (Chicago Black Hawks). Vermont featured four players on its 2012/13 roster who had already been drafted by National Hockey League clubs including defenseman NICK LUUKKO, a Phiadelphia Flyers prospect (2010, 6th round, # 179 overall) who was also one of the Catamounts’ four players hailing from the Commonwealth of Pennsylvania … of course, Penn State’s lone NHL prospect on its team sheet during its first-ever season of NCAA hockey was the University of Minnesota transfer, MAX GARDINER. So, maybe it was the absolute electric atmosphere at the Wells Fargo Center that genuinely helped power upstart the Penn State Nittany Lions to an insurmountable 3-0 lead in the first thirty minutes of that memorable 4-2 triumph over the more-experienced Vermont Catamounts at the inaugural Philadelphia College Hockey Faceoff last January, then. “I don’t know if was so much the win but how it happened, where it happened. I mean, what a tremendous environment to play a hockey game in. You talk about rising to the occasion, I think the Penn State alumni and Penn State fans have a huge part in that,” stated an obviously elated Nittany Lions head coach Gadowsky after the game. Penn State defenseman CONNOR VARLEY (3), the homegrown freshman from Lansdale who ending up leading all PSU rearguards with 12 points during the historic 2012/13 NCAA season, supervises as Nittany Lions goaltender MATT SKOFF (31), the homegrown freshman from McKees Rock, prepares to smother the puck at the feet of a trio of Vermont players including sophomore right wing COLIN MARKINSON (6), the local product from Princeton, New Jersey, and junior left wing CONNOR BRICKLEY, the 2nd round pick (# 50 overall) of the Florida Panthers at the 2010 NHL Draft who represented the United States at the 2012 IIHF World Junior Championships, during the NCAA non-conference meeting at the sold-out Wells Fargo Center in Philadelphia.